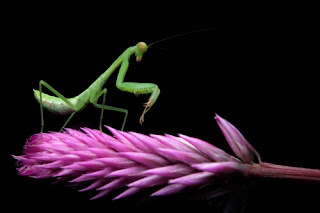 Let's Talk Praying Mantids (or is it “Praying Mantises”?). Although some people use the term “Praying Mantises” as a plural for Praying Mantis, for our purposes here we will be calling them “Praying Mantids”, as it just makes things simpler. After all, “Praying Mantis” refers to an insect that belongs solely to the genus Mantis, whereas a Praying Mantid is an umbrella term for all types of mantids. There are three main species of mantids found in North America-the Carolina mantid (Stagmomantis carolina), European mantid (Mantis religiosa) and Chinese mantid (Tenodera sinensis). The Carolina mantid is the only species that is native to our continent, the other species were introduced either accidently or intentionally (depending on whose account you choose to believe) sometime before or around the turn of the 20th century. Many people consider the introduced species to be invasive, while others point to their long-term residency here as proof they have adapted and cause no harm. We will leave it to our readers to come to their own conclusions on this controversial subject. Praying Mantises hatching - many more will follow! As I write this, we have reached the time of year (late spring-early summer) when people are beginning to find mantids in their yards and gardens. Mantids lay their egg cases (oothecas) in the late fall-early winter and these oothecas stay dormant until warm weather returns and then hatch. If you are finding mantids in your garden and have not purposefully placed oothecas there to hatch-congratulations-you have created a welcoming place for a really cool insect. If you purchased oothecas and are waiting for them to hatch, please check out the hatching instructions on our website. 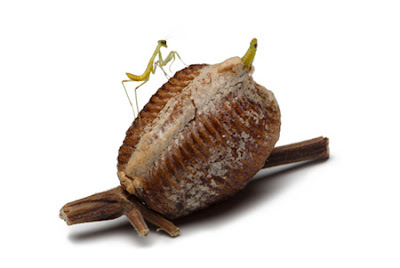 It can be difficult to know when an ootheca hatches as the egg case will remain behind and can look untouched. Newborn mantids wiggle their way out and quickly disperse. Check out the video below to see them in action. Mantids can be beneficial, but should not be considered as useful in pest control as insects such as green lacewings or ladybugs. There are several reasons for this: one is that mantids will not develop a large population in a specific area that could combat a pest infestation. This is largely due to the fact that they are enthusiastic cannibals. Mantids are just as happy to eat their own as they are to eat other insects. Once hatched, they usually try to get away from their siblings as quickly as possible (a phenomenon that is all-to-familiar for many humans). Additionally, since they are voracious eaters, they need plenty of their own space to meet their food needs. Yet another factor that make them the less-than-perfect beneficial is that their murderous tendencies are unrefined. They will devour a honeybee just as quickly as grasshopper, making them a threat to insects that are considered desirable. Like any other insects, pesticides can seriously reduce the number of mantids in an area. If you must use a pest control agent, we suggest you use products containing Bacillis thuringiensis and insecticidal soap targeted for soft-bodied insect control. These products have little effect on mantids. To develop the best possible habitat for mantids, remember to not over-groom your garden. These predators need vegetation to provide cover for their hunting and for a place to lay their oothecas in for next year. Beneficial Nematodes - What Products are They Compatible With? 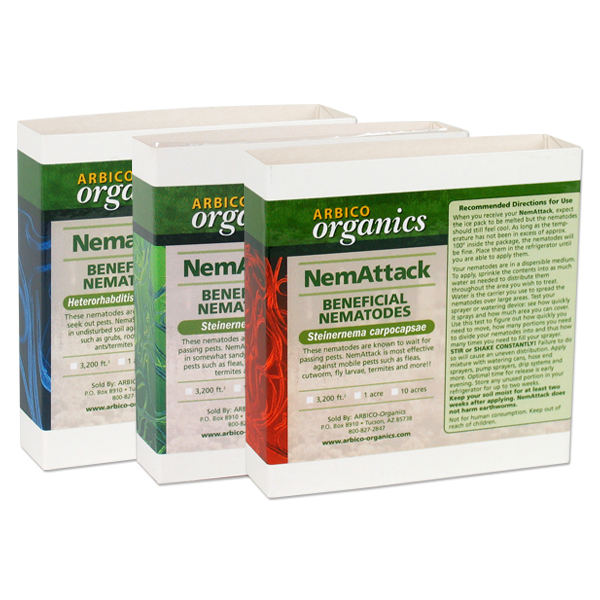 Our ARBICO Organics Beneficial Nematodes are one of our most popular and most effective controls for a wide-range of insect pests. These live microscopic organisms (non-segmented round worms) occur naturally in soil throughout the world. They are parasitic to insect pests that typically have a developing (larval or pupal) stage of life in the soil; however, they have been known to parasitize above ground stages of adults, nymphs and larvae. 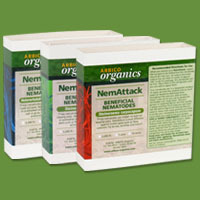 Beneficial nematodes can be used around and will not harm mammals, aquatic life, birds, reptiles or amphibians. One of their best features is that they are extremely easy to use with other pest and weed control treatments! Beneficial nematodes can be used in conjunction with a variety of traditional chemical pest controls products and of course, natural products (listed below). In some cases, combining treatments is even synergistic, increasing the effectiveness of both modes of control! 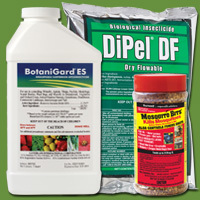 Below is a list of common chemical ingredients used in pest control and their compatibility with nematodes. Additionally, most of the environmentally friendly products we offer are compatible! After application, the nematodes immediately get to work finding pests to parasitize and kill. Once inside, the nematodes produce a bacteria toxic to their hosts that kills them within 24-48 hours. These beneficial nematodes are amazing in so many ways, and their resilience lends itself to being just one more reason that they are so popular with gardeners and growers of all kinds. We believe in arming our customers with the information needed to make organic pest control successful. You probably have questions that are not answered in this post, so we encourage you to call us at 1-800-827-2847 or email us at drbuglady@arbico.com if you do! If you ever need further proof of how wondrous Mother Nature is, look no further than Corn Gluten. This by-product of processed corn is nature’s weed and feed and can perform seemingly contradictory functions. Corn Gluten has the ability to be a powerful pre-emergent herbicide for weeds while also being a potent fertilizer for established plants. Corn Gluten, when applied in a lesser volume than the rate for herbicidal action, acts as a phenomenal fertilizer. This is due to its Nitrogen-rich properties (9-0-0). 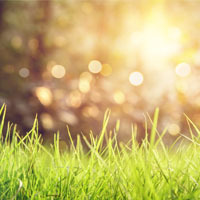 When used on established lawns and plants (those that are rooted with true leaves), Corn Gluten will promote richer turf color, thicker lawns and all-around healthier growth. Each additional application will build on what’s already there to encourage continued greening. As the slow release of the nitrogen greens up your growth, it will also aid in the creation of richer, healthier soil. An added dimension of weed control in Corn Gluten is that weeds prosper in poor soil; so, as your soil becomes healthier, you will see a natural reduction of weeds. When using for weed control, apply when rain is not expected for a few days. It’s important to water in the Corn Gluten and then let it dry out. 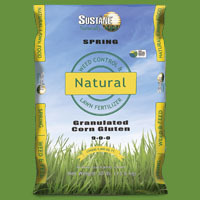 Don’t sow a lawn or plant seeds for six weeks after applying Corn Gluten. This will give it a chance to lose its herbicidal qualities. Corn Gluten will not change to pH in your soil. The Corn Gluten Meal sold as animal feed is not the same thing. Often people are lured by the lower price of this variation, but it simply does not have the same protein concentration to be effective as a seed killer. So, to re-cap: Get your Corn Gluten out early and stop weeds in their tracks. Then, wait six weeks and begin using it again to add a blast of nitrogen to your lawn or garden. Continued usage will keep what you’re growing vibrant and aid in developing healthy, weed-resistant soil. 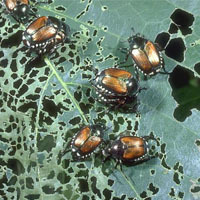 Japanese Beetles can decimate crops above and below ground, leaving huge swaths of land barren and unproductive. These grubs are naturally detritivores (meaning that they eat decomposing materials), but they also feed on plant roots. Once they start to feed on roots, water and nutrient uptake is severely hindered. This results in brown and patchy dead spots in turf, lack of plant vigor and stunted growth. Unfortunately for the grower, this is only part of the plague that is the Japanese Beetle. Adult Japanese Beetles skeletonize leaves, strip flower petals and damage developing fruit. While their grubs feast on plant roots, the adults are opportunistic and tend to eat whatever they can get their little (yet voracious) mouth parts on. Some of their favorite host plants include roses, beans, grapes and berries. Where Are They? Should You Be Worried? Japanese beetles are found predominately in the eastern part of Unites States, from the Atlantic coast to states that border the west side of the Mississippi river. They have, additionally, been spotted in several Midwestern states, although their numbers and distribution vary in these regions (i.e. Texas is only considered partially infested). Chances are if you live in an area with lawns, prairies or grazing areas, you can expect Japanese beetles to make their way to you, if they haven’t already. Japanese Beetles are often described as iridescent green beetles. Other beetles like the Fig Beetle and False Japanese Beetle are often mistaken because of this. While their heads are a metallic green, their wings are a brown to bronze color with recognizable white tufts around them. Look for the tufts for a positive ID! How Do We Control Them? The best way to control Japanese Beetles is by stopping them before there is an infestation through preventative treatments. These treatments include applying beneficial nematodes to kill grubs, using Milky Spore to prevent yearly recurrences and utilizing row covers to limit damage. If prevention is not an option or if you have adult beetles making their way in from nearby areas, then direct, spray-on treatments will be your best plan of action. The infective fungus, Beauveria bassiana, kills both grubs and adults while remaining harmless to beneficial insects. 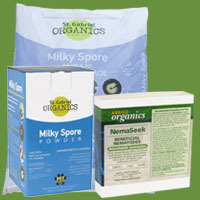 It is a fantastic choice for organic growers trying to stay away from conventional pesticides. Surround WP is the next best option to save your plants from damage. Sprayed onto foliage and fruit, it deters beetle feeding and helps shield plants from heat stress. There are a number of DIY traps we have found online and would love to hear any other ways you have found to control these bad hombres! As spring finally arrives for those of us in need of a deep thaw, our attentions turn to the garden and how to best put it to use in the upcoming season. For the organically inclined, there is no better first step to a healthy spring garden than applying beneficial nematodes. They help control a vast range of insect and arachnid pests in the soil and help maintain a bioactive soil network essential for healthy plants. The question is: when is it best for them to be applied? The truth is, there are probably native beneficial nematodes overwintering deep in your soil already. For raised bed or container gardeners this may not be the case. A general rule of thumb is to apply the nematodes after your last expected frost date (found here). Unfortunately, weather patterns and climates have become quite unpredictable in the past few years, so the listed date may not always apply. For those aberrant weather anomalies, it is helpful to know the temperatures at which nematodes remain active. These hardy creatures are effective parasites in soil temperatures down to 42 degrees Fahrenheit; below that they enter a period of dormancy. It is important to note that soil temperature, not air temperature is the main factor for nematodes’ continued viability in the soil. Because soil temperatures are the critical factor, a soil thermometer is a handy tool to have lying around. 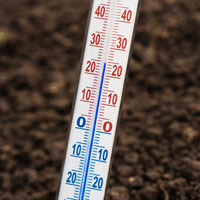 Measuring soil temperatures periodically allows gardeners and growers to chart changes from year to year and adjust treatments accordingly. Just like timing insecticide applications, timing your biorational control treatments properly is a vital part of successful integrated pest management. We welcome input from our readers and would love to hear any tips, tricks, questions or comments you have below! “The root word HUM comes from the Latin humus, meaning earth and ground. The Latin humanswhich means MAN begins with HUM. HUMus = earth, then becomes HUMble = lowly; and finally, to HUMAN”, Dr. James Cassidy. Last month at the High Desert Conference in Sierra Vista, I had the eye-opening and mind-expanding experience of meeting and listening to Dr. James Cassidy of Oregon State University. Wearing a fedora and suit jacket covering a black t-shirt with bold white letters spelling out SOIL, Dr. Cassidy opened by holding up a minute particle of dirt. He asked a slightly confused audience to identify what he held between his fingers. When we responded with ‘dirt’. He answered with “a million bio-organisms”. A highlight of his talk was being introduced to the new Soil Web Apps that UC Davis and the California Soil Resource Lab have produced. These apps can be used to access USDA-NCSS soil survey data – which drills down to the soil type in your backyard. FYI – my land is not prime farmland. When overlaid with mapping of geo-political upheaval, it is striking how closely linked poor soil is to conflict, poverty and starvation. Organic Matter and Microbial Life – our dirt is sadly lacking in these organisms. The microbial life consists of bacteria, fungi (mycorhizzae), arthropods, nematodes, protozoa and in some areas – earthworms. Minerals in the soil include nitrogen, potassium, phosphorous, iron, calcium, magnesium, manganese, sulfur and a host of other nutrients that are essential to plant health and our own health. 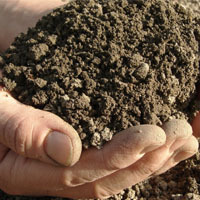 The good news – no matter where you are, your soil can be improved by adding microbial life. Dr. Cassidy’s solution mimics what I have learned from my best teachers – add compost. It’s as simple as that. Have you ever taken a moment to ponder your soil's microbial profile? Do you seek out soil solutions to boost your microbial populations? Let us know about your piece of the earth/humus and we will be glad to offer our advice! No matter how we come to the place of making a change, our paths are lined with options.We have great freedom to pick and choose what works best for us. In my experience, working in the garden provides new opportunities for learning and decision-making every day. Over time, I’ve done an informal survey of my fellow organic gardeners asking them how they reached the idea that it was time to rethink our use of chemicals in our landscapes. Many came to the idea after a health scare or when a chemical they had used is suddenly labelled as carcinogenic. Some of us move to the organics gradually based on many reasons – for me it’s important to leave a smaller footprint both in what I take from the earth and what I leave behind. To do this, I try to move to increasingly sustainable methods of growing. 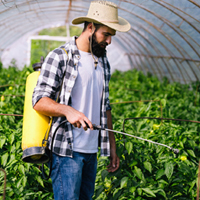 One of the most important developments in sustainable agriculture are the biorational pest and disease control products that are being developed and are increasingly available to farmers and home gardeners. It’s a wonderful world of selective products that are relatively non-toxic to humans, animals and beneficial insects. The use of biorationals fits well within an IPM (integrated pest management) strategy in which a keystone principal is monitoring for and identifying the specific pest that is in the landscape. 1. Botanicals are derived from plants. This category includes pyrethrins, azadiractin, neem oil, garlic and many others. 2. 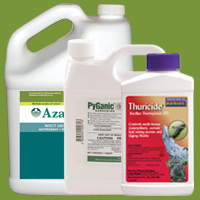 Microbial pesticides are formulated from beneficial micro-organisms or their by-products. 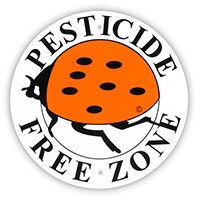 This includes insecticides that are bacteria, fungi, nematodes and protozoa. One of the outstanding qualities of microbial pesticides is that they are very specific to the target pest and have little or no effect on other species. (Surround WP) and iron phosphate (Sluggo) are examples of this category of biorational. Biorational Disease Controls are typically botanically based or microbial. In the disease control world, most of the microbial biorationals are bacteria or fungi. Each of these categories, and indeed each biorational, deserves their moment in the sun. Stay tuned because we will be delving into many of the biorational control options in future posts. In the meanwhile, we would love to hear from you if you have questions about biorationals or a comment about one that has worked for you.